Autism Spectrum Disorder (ASD) is not well-understood as there are no defined mechanisms of aetiology or pathogenesis and presents as varied neurodevelopmental conditions [1; 2]. It is characterized by early-onset challenges in reciprocal social interaction, cognition and perception; and communication. Additionally, there may be unusually restricted, repetitive behaviours and interests [1; 2]. Those individuals who fall within the ASD-spectrum, may also present with executive dysfunction and atypical information processing . The aetiology and pathogenesis of ASD may be attributed to multifaceted interactions between genetic and non-genetic risk factors. The latest revision of the DSM (Diagnostic and Statistical Manual of Mental Disorders): the DSM-V, which was last updated in May 2013, adopted the broad term of ASD without specifying subtypes. 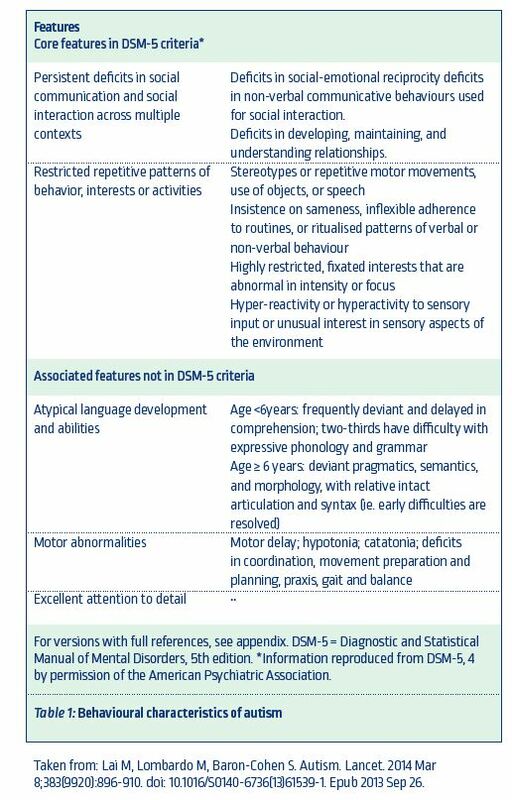 ASD was reorganized from a triad into a dyad, with atypical language development being removed from the criteria which is now considered an affiliated condition, with variations thereof. Epidemiological studies have identified certain environmental risk factors but these were identified more as associations than causalities. Gestational factors could include complications during pregnancy and chemical-exposure. Alternatively, folic acid supplements before conception and during early gestation seem to be protective. Vaccines such as thiomersal-containing, MMR (Mumps, Measles and Rubella) or repeated vaccines do not seem to cause autism according to the article entitled “Autism” from Lancet by Lai, et al (2014). With emerging therapies, the use of stem cells is increasingly being used in clinical trials to prove safety and efficacy. Exclusion criteria included the following: prior history of severe allergic reactions; any severe psychiatric disorder or an alternative ASD such as Asperger syndrome, Rett syndrome or undefined pervasive developmental disorders; seizures within the past six months; active epilepsy, cerebrovascular diseases or brain trauma; severity of Illness (SI) of Clinical Global Impression (CGI) scale evaluated as “Normal” or “Borderline mentally ill” or “Mildly ill”; moderate or severe extrapyramidal symptoms or tardive dyskinesia; severe self-injury behaviour; active systemic or severe focal infections including Human Immunodeficiency Virus (HIV), syphilis and hepatitis; autoimmune diseases; severe pulmonary and haematological diseases, malignancy or hypo-immunity; undertaking other treatments that may affect the safety and efficacy evaluation of stem cell therapy; enrolment in other clinical trials in the last three months and lastly other clinical conditions that the investigators considered not appropriate for enrolment in this study . Transplantations included four stem cell infusions through intravenous and intrathecal injections once a week. Treatment safety was evaluated with laboratory examinations and clinical assessment of adverse effects. 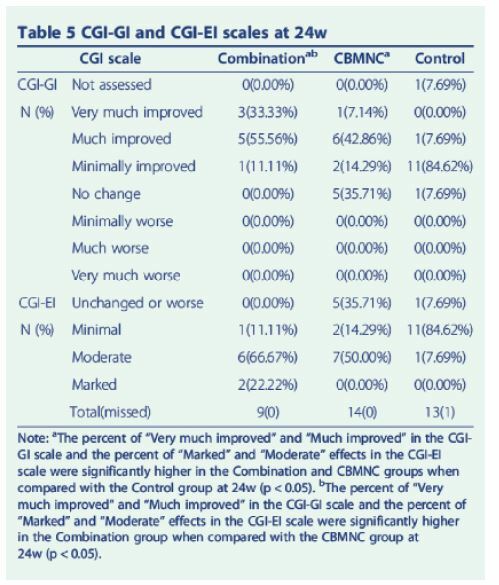 Therapeutic efficacy at baseline (pre-treatment) and post-treatment was assessed using the Childhood Autism Rating Scale (CARS), Clinical Global Impression (CGI) scale and Aberrant Behaviour Checklist (ABC). Please see Tables 3, 4, 5 and 6 below. 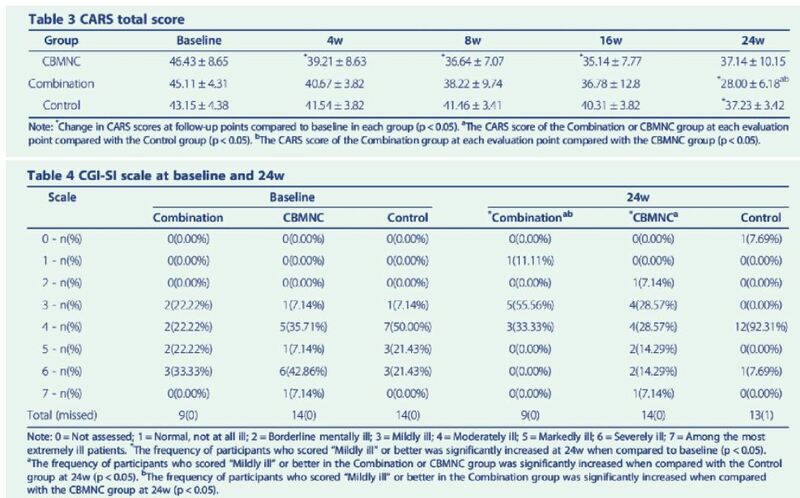 fever (3 subjects in the CBMNC group and 2 in the Combination group) and recovered without medical interventions. 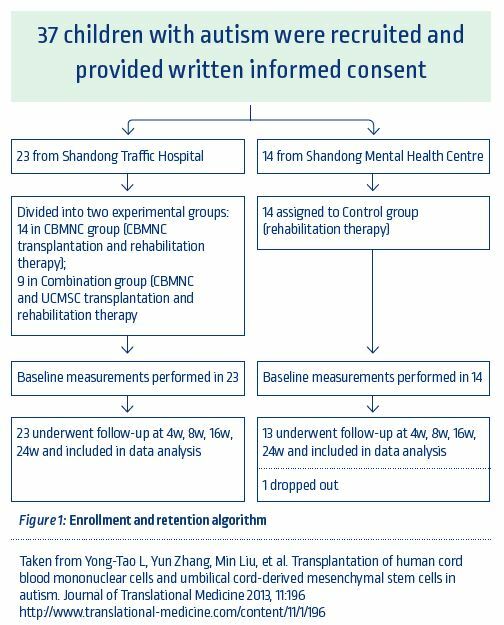 No other adverse events were noted in the 2 transplantation groups. In conclusion, umbilical cord blood and tissue cells show a lot of potential in the holistic therapy of improving life for individuals with autism. 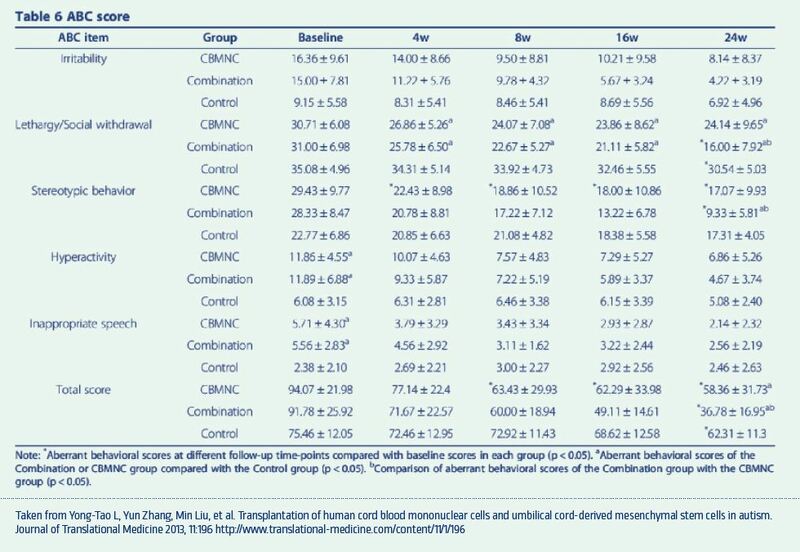 Lai M, Lombardo M, Baron-Cohen S. Lancet.2014 Mar 8;383(9920):896-910. doi: 10.1016/S0140-6736(13)61539-1. Epub 2013 Sep 26.